"My wife and I are just thinking about what to do next. I care a lot about where the country is and we'll be sorting that out," he said. Webb indicated that any announcement wouldn't come any time soon, if he decides to jump in. "Well, if you look at how I ran for the Senate. I announced nine months before the election with no money and no campaign staff," he said. "It takes me a while to decide things and I'm not going to say one way or the other," he said. While Webb might have designs on the White House, would he serve as vice president? He said being No.2 "wouldn't be a good fit." Webb, a former Navy secretary and assistant defense secretary, was narrowly elected to the Senate in 2006. He left after one term. 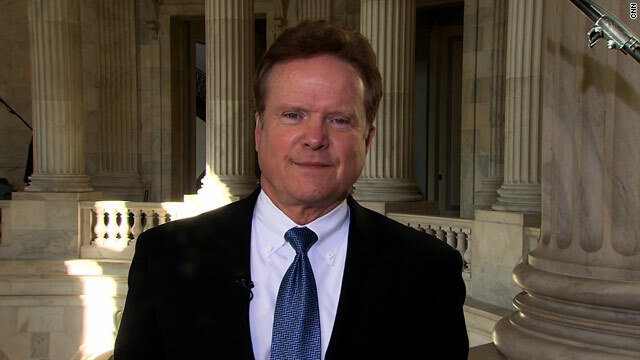 In the Senate, Webb was a centrist, and never a reliable vote for his Democratic leadership. He focused heavily on military and foreign affairs. He said the United States needs to focus its national security priorities to create consistency and solidify America’s standing abroad. "The thing that concerns me most is that we are kind of bouncing from issue to issue without a clear articulation of what the national security interests of the United States really is," he said. He's written 10 books and his appearance on NPR coincides with his latest work titled, "I Heard My Country Calling." He would make an excellent Democrat candidate. He doesn't have the baggage that Hillary has, has the look, voice, background, and name of someone tough. Plus he's from the south. He will not be nominated. Hillary16. Go for it. Another sacrificial lamb for Hillary. I respect Mr. Webb's service to our country. But this is a guy who did not like being a senator. Now he wants to be president? Go write another book, Jim. The democrats do not need you. First you wanted to be a senator and now president? So jump in among the sharks. Maybe they won't eat you alive. I don't think that he has the name recognition to get anywhere close to winning unless Hillary Clinton and others endorse him. Only those of us who follow politics really have any inkling of who he is. Ms Clinton could use the work before the general. So, I say go for it. You will not win, but push her to the limit so she will be good and ready for the general. Can't wait to see Tom Tillis,Sheldon Adelson,Rupert Mourdoch,Rove,Grover Norquist and the GOP stuff Jeb Bush down the tea party's throats EXACTLY like they stuffed Romney down. The drumbeat is getting louder.